The 2032 inverter is perfect for small projects like costumes. Runs two feet of EL wire. The small 3 volt 2032 battery pack runs up to two feet of EL wire. The perfect unit to add a touch of EL wire to any costume or project. Runs on one CR2032 battery. 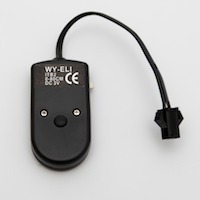 These have two control buttons making them easy to turn on and off or change lighting effects. They also have solid on and blink mode. 1 inch by 1 3/4 inch by 1/4 inch.